Craig Huey, in this week’s show, tackles a tough subject when he answers the question, Is Traditional Direct Marketing Dead? Of course, he says it isn’t, and with good reason, but the naysayers are out there. Huey says direct marketing is stronger than ever and is more accountable than most programs. 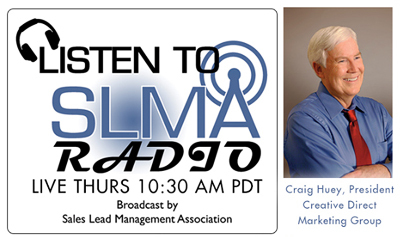 Hear what he has to say and learn why direct is more direct and profitable than ever in this interview with SLMA Radio host Jim Obermayer. Creative Direct Marketing Group, INC. (CDMG) is a full-service, direct response advertising and digital marketing agency with one goal in mind: increasing your response and profits through “accountable advertising. For more than 30 years, we’ve helped turn entrepreneurial start-ups into large companies…and large companies into multibillion-dollar businesses. Through 7 recessions, 2 inflationary periods, as well as times of economic prosperity, CDMG has consistently achieved breakthrough response rates for our clients.